I have recently started watching a Hindi TV series called Ladies Special. I like it cause its refreshingly realistic compared to other sagas dished out these days. It is a story of four women who are travel together in a train called 'Ladies Special' in Mumbai. It revolves around their day-to-day lives and issues faced by them. One of the protagonists is 'Pooja' who is married to a guy who is evil personified. He constantly keeps a watch on her and is abusive to her physically and mentally. In spite of being educated and earning well, he is very mean and cruel and uses his physical strength to control her. I have a friend who is going through a similar situation. The worst part is she is in USA without a support system of family and friends. SHe comes from a middle class family with parents who are retired and an elder sister who is also facing problems in her marriage. Not being financially independent has added to her woes and in spite of knowing the risks, she has decided to go back to her husband. 'Domestic Abuse' which was a word I had read many times and seen in movies has now become a reality. This word does not only mean physical abuse but even mental and psychological in which the abuser will use words, body language and other means to steal your self confidence, respect and wear you down to gain complete power over you. A recent government survey said that one in every three Indian women are victims of Domestic Violence and the numbers are escalating each year not taking into consideration the number of unreported cases. India has a Domestic Violence act, that was passed in 2005, but the long held attitudes about Domestic violence in India makes deliverance of justice remote. With the cases dragging for years together, do the abused women have any actual relief? In addition, the social stigma attached to Divorce or going against family integrity stops many women from taking any steps. Financial Independence is another hindrance in the path of getting any relief. Even though this law has, many such provisions the relief is hard to come with the cases adjourned and bribes being paid by the husbands to stall cases. Does it ultimately boil down to a woman's fate or luck? If she has good luck, she will be happily married or say 'Uska naseeb hi kharab hai'. Do we just shrug our shoulders and let other people deal with it? What do I say to her? How do I comfort her? There is a whirlwind of emotions and questions in my mind and depressingly no answers. P.S: The views in this article are mine and I have written only about violence against Women. I am aware that even women abuse men and there is no intention of disregarding this fact. Finally you wrote about it. You are right. Its time for Indian ladies will have to put their foot down against domestic violence. Kehte hai na k Zulm sehne vala bhi gunhegaar hota hai!!! Domestic Violence is such a common thing - not just in India , abroad, in developed countries as well.. Women, apparently think that they have done something to deserve such treatment and it takes them a lot of effort and strength to come out and seek help. The social pressure plus financial dependence, all play a huge role. Wonderful post! I am sure posts like this will make a difference in the long run! Nice post and thoughts,LP..frankly,I'm not really sure what the root cause of domestic violence is. I guess one major cause is the ego..be it in the husband or the inlaws or any other 'Shakuni mama'types in the family..at other times,it's jealous people filling the ears with bad things..
Nirali : Yes True but sometimes there are no easy solutions. Hi,LP...re. why I'm not addicted to the serial yet-it's probably coz the episodes are linked and it's more serious than comic.And,I just avoid serious stuff these days. gimme ur email id-I'll drop u a really nice book which I have in e-form..or,drop me a line on ayeayealatgmail. I have sent u a chat invite on ayeayealat@gmail.com. I hope this is the right one. amit: heheh i sent it to some other id pehle. Have sent you a new one. ohhh..I was looking for someone called pineapple, requesting a chat with me..didn't know ur real name,u see..:)just clicked 'yes' to the invite. Hey. Could you just drop a test mail at cynicinwonderland@Gmail.com, just wanted to check up with you. Have u gone into hibernation? hmmm well not hibernation...just into mourning...my laptop died recently...will put up something soon. Ohh..you explained the reason-I thought maybe you're trying to live up to the title of your blog for a few days(Lazy P)..hehehe..sorry,couldn't resist that quip,LP. Congratulations! 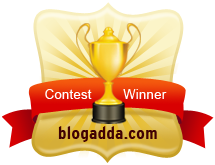 Your post has been selected by BlogAdda as one of the top posts for this week's 'Tangy Tuesday Picks'. Hey there,LP!I'm not sure whether you're temporarily off blogging,hence I did not tag u in my latest post..if you're back,consider urself tagged...I'll amend my post.hehe! There are no easy answers to the issue. You can only support and encourage the person to get out of the abuse. It is not only about financial independence. There are psychological and social issues too.I hope your friend does what is best for her. suchismita :I agree with you...Ive given her as much info I can and continue to support her even if I am far away right now.Thanks and do keep dropping in. This post is a little old, so perhaps there is an update on the situation - is there.. any improvement, i.e.? Shikha : Thanks for checking my old posts. My friend is still in the same situation. She will shortly be taking legal assistance and then think about how to get out of the situation as safely as possible. She is always in my prayers. 1) for your friend to truly believe that this man is pure-evil and therefore, being with him is dangerous to her physical and mental existence. I say this, because, typically women in such situations exhibit a variant of the Stockholm Syndrome, where the abused actually has some sympathy and positive feelings towards the abuser. Abusive people are particularly very good at making the abused believe that their destructive behaviour was caused by some anomaly in the abused persons' behaviour. And some men, esp. husbands, are also good at begging for forgiveness after a particularly violent episode or dismissing bad behaviour as normal. So most abused women either end up feeling sorry for the husband after they've left them, or continue to stay with them in the hope that there will be some change in the long run. In your friend's case, it is important for her not to lapse after she's left him. This may perhaps be her only chance at getting away, and going back to him would be extremely dangerous. 2) Unfortunately, her support system seems to be a huge problem - what with retired parents, and already a sister who's having marital trouble. Poor thing. What she really needs is support and strength. Hopefully, the parents will be supporting her now, so as a friend, if you can rally other friends also to support, she may find it easier to break off. The worst time may not be the period she breaks off, but recovering post. She should ideally be living with someone after this - someone close - since after such traumatic experiences, some women get emotionally depressed - and keeping her mental state positive is very important during such a time. 3) Legal assistance - may be difficult for her to handle alone, so she would need senior members to help her out - I hope that is covered too. Another thing you could do is to encourage her to get in touch with organizations that enable women to sustain after such traumatic experiences. Finding work is very important, but also some of her trauma may be reduced when she gets in touch with people who've experienced the same. Finally, as her friend, let her know that this is not the end of the world. She did not deserve to be at the receiving end of such treatment, but definitely,the fact that she's been thru this is not her fault. Just that some people in this world are sick, mentally. and its like being afflicted with a disease. She needs to forget. And rebuild her life, with hopes of love and happiness in the future. Here's wishing her the best ! Shikha: Thanks a ton for all the suggestions you have given, they are very insightful and would be a great help. My friend is surely not suffering from the S syndrome. Since this is a very sensitive issue, i think we should get in touch via mail so that I can explain in detail.My email address is there in the 'About' section. I am not mentioning it here since you know about SPAM. Waiting for a mail from you.